Here’s a story that’s guaranteed to bring a tear to your eye. 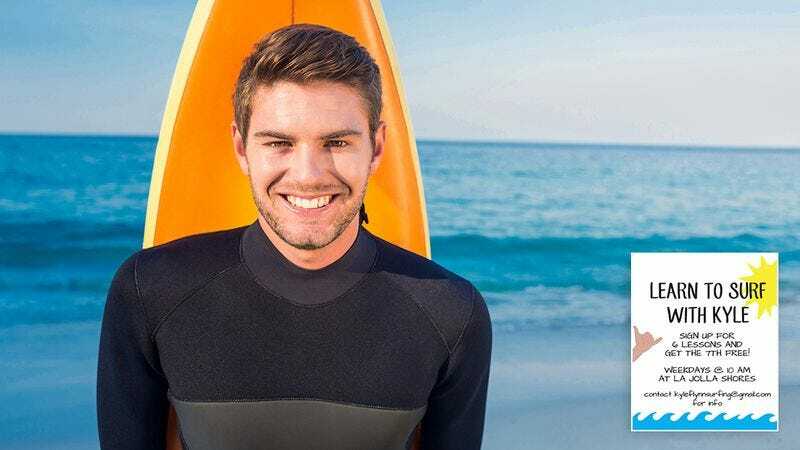 Kyle Flynn, a surf instructor in La Jolla, CA is giving back to his community in a big way by doing something absolutely amazing: Whenever anyone signs up for six surfing lessons with him, Kyle gives them a seventh lesson for free. What a beautiful act of kindness! Just…wow. In a world too often consumed by hate and selfishness, it’s nice to see someone like Kyle who is so committed to generosity that on top of all this, he’s offering a free wetsuit rental each time you refer a new student, and giving anyone who “likes” his page on Facebook a free sticker from the surf shop. Bravo, Kyle! You’re a shining example for us all.